Marley has remained a residential community. In 1830 Charles Snoad came down the Indian trail with other settlers, purchasing land. 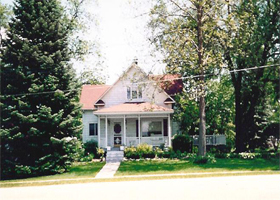 In 1860 missing trees along the trail and on his farm, he purchased maple saplings in Michigan and planted them in a straight line along the road, known for generations as Maple Street [U. S. 6]. Chester Herman Marshall in 1833 purchased land along this same narrow road, coming from New York with his wife Permelia and one son George. His other son, Rollin came the next year with his wife, Ann Burrill Marshall, and three sons, Chester Herman, George Nelson and Jacob Burrill. Ann died soon after her arrival. Some of Chester's eight brothers and sisters, nephews and nieces, came from the East and purchased land from Chester or from others nearby. Some of the relatives attended the O'Plain Baptist Church at Hadley, the predecessor of the Marley Community Church. In 1859 at age eighty, Chester died and was buried at the cemetery named Marshall, near the early Marshall log schoolhouse, built in 1837. 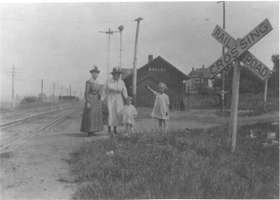 Although the settlers of the area did business in Hadley in Homer Township which had two general stores, a church, a blacksmith, sawmill and post office, over time the community at Hadley dwindled. Marley was born in 1881 when the Wabash Railroad, cut through the wooded hill on the southeast corner of George Haley's farm leaving a triangular tract of land laid out by the surveyor as the village of Maple Street. It consisted of five blocks of land with 111 lots, four streets along with five alleys by which to reach the barns. In 1879 Griffin Marshall had built a two-story frame house to serve as a store and post office downstairs and a home on the second floor. When asked to name the post office, Griffin took the suggestion of a young Haley lad of Mar(shall.) + (Ha)ley. Marley had a depot, pump house, coal chutes, section house, granary, stockyard, and blacksmith. Marley became a milk-shipping station to Chicago. 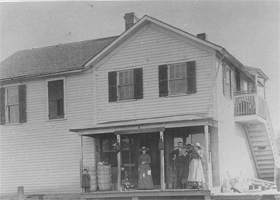 In 1893 the store, now owned by C. F. Haley, was moved to Maple Street and converted it to a nine-room residence. In its place he erected a new larger store with a large hall above, which provided space for all kinds of community activities. There were three public wells, and a board sidewalk between the depot and the residences. The Baptist Church was built in 1899 [now the Marley Community Church] and has remained an important asset of the community. A serious freight derailment in 1932 damaged the station and other facilities. The railroad buildings were never rebuilt. This brought a serious slow down in population growth. 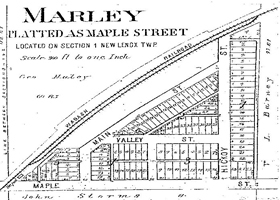 Marley has never incorporated and business was gradually taken away to the communities of Mokena and New Lenox.